My fiancée and I visited Sundaram's, a restaurant located in Sector 26, that serves authentic and delicious South Indian food, and is open for breakfast, lunch, and dinner. Google maps indicate that the restaurant is open from 7:00 am. One day, we went by 7:15 am and the staff said that breakfast would be ready only by 9:00 am. We were disappointed then but decided to return on another day. So today we reached the restaurant by 9:30 am. Once we entered and sat at the table, Mr. Ranjit, the manager approached us and greeted, and gave us the menu to order. Moments after ordering our food, the manager served us Rasam, which is the welcome drink for customers. Rasam was hot and spicy. I must admit that I always disliked drinking Rasam from a glass but recently that changed. Rasam is a South Indian soup, traditionally prepared using tamarind juice as a base, with the addition of tomato, chili pepper, pepper, cumin and other spices as seasonings. Rasam is also eaten with rice. 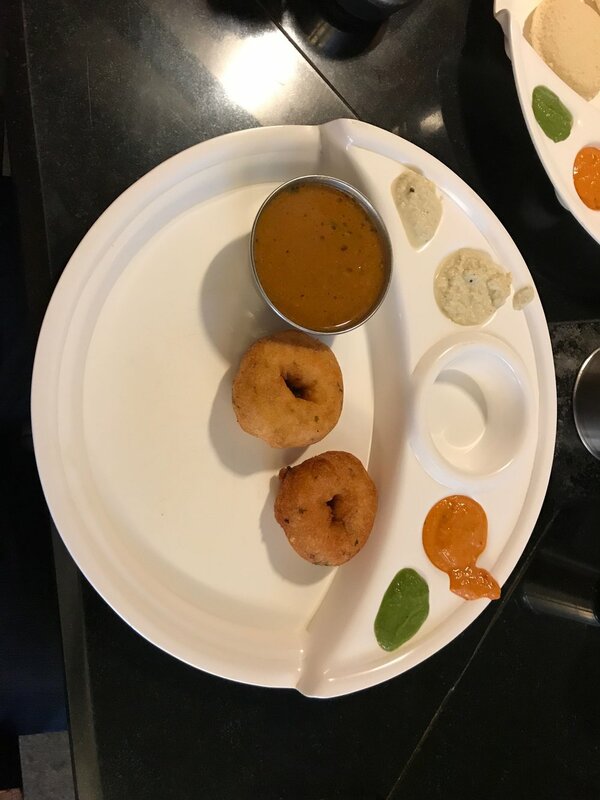 Without wasting time, we ordered a plate of Idli which normally has 2 pieces but at Sundaram's three pieces are served alongside coconut chutney, tomato chutney, coriander chutney, and a steaming bowlful of sambar. The tomato and coriander chutney was tangy. The sambar was spicy and packed with flavors. Even the vegetables inside the sambar were cooked well. K.T. Acharya, the food historian, speculates that the modern idli might have originated in the region that is now Indonesia, which has had a long tradition of fermented food. The Medhu Vada was crispy on the outside and soft on the inside. Many love immersing pieces of Medhu Vada in a bowlful of Sambar and then eating it. I prefer it both ways. The Onion Rava Masala Dosa was crispy on the outside and soft on the inside because of the masala. I am not a fan of Onion Rava Dosa but I did enjoy this one. Dosa/Dosai is being made for the past 2000 years. Dosa varieties have constantly been experimented with and with a recent count there have been around 624 varieties of Dosas! We also ordered for a filter coffee and it was very delicious. Being tambrahms (tamil brahmins) drinking a filter coffee while eating breakfast is a must for us. Many of us have 2-3 cups of filter coffee a day. Some like the coffee strong and some do not. You too can make your own South Indian filter coffee at home.